Nikon D750 & AF-S NIKKOR 24-120mm f/4G ED VR lenses rigged up with Atomos Ninja Star recorders ready to capture interior views for Ride Along. For all points of view, the AF-S NIKKOR 24-120mm f/4G ED VR is used. 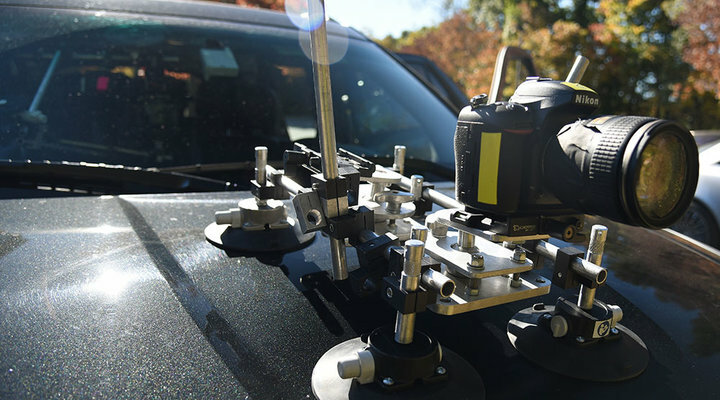 “This lens provides just the right depth of field flexibility to work in close proximity while providing the right look to anything in the background outside the car,” asserts Marks. Imagine shooting the breeze with pro athletes from basketball, football and baseball while riding down La Cienega Boulevard in Los Angeles, or catching the latest from surf legends while cruising along the beach through Miami. Ride Along presents it up close and personal. Dan Marks and Adam Goldberg are co-founders of South District Films (SDF), a company that produces sports documentary, commercial and digital series for Internet and broadcast networks. Passionate fans of all sports, Marks and Goldberg created the company in 2013 after several years independently pursuing freelance production, directorial and editing projects. The South District Films client list includes names such as Nike, Vice Sports, Taylor Made golf and more. SDF is based in Venice, California. Combined, the founding partners count seven Emmy Awards, plus a prestigious Peabody Award for work on ESPN's 30 for 30 (Sole Man, Pony Excess, Straight Outta LA) and HBO's 24/7 series. For more information, visit the website at www.southdistrictfilms.com.